Project Scope: Naome Swan has studied extensively in the fields of emotional healing and spiritual counseling. She is a Certified Vipassana Meditator, as well as a Certified Intuitive, Clairvoyant, Certificate of Ordination, Reiki Master, and Certified in the School of Sexual Energy Virus. She was most recently certified as a Holographic Kinetics Practitioner. 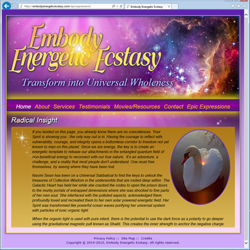 Swan enhances, transmits, and oscillates energy while seeing through the multidimensional realities within your own Universe. She assists with past life time loops, inner insight, after death communication, sensitivities, inner child healing, soul retrieval, pre-birth emotional healing, vibrational energy scans, support with infertility issues, and is highly skilled with twin flame/relationship challenges. Swan’s wisdom awakens the power of inner balance, divination, innocence, self-esteem, and is associated with inner love, grace and beauty. Swan understands the symbolism of dreams and universal language of Oneness. The animal totem Swan is sacred to the planet Venus, the Love Goddess. The key to all relationships are commitment to self. By seeing inner – dimensions Naome, exposes your brilliance of energetic ecstasy, while grounding your circuits into the Heart of Mother Earth. Design Components: Naome had some wonderful design inspirations and we coalesced them into a cohesive design, converted the design into a style sheet and added in her content. The site also features a blog allowing her to maintain the site's writings on her own.